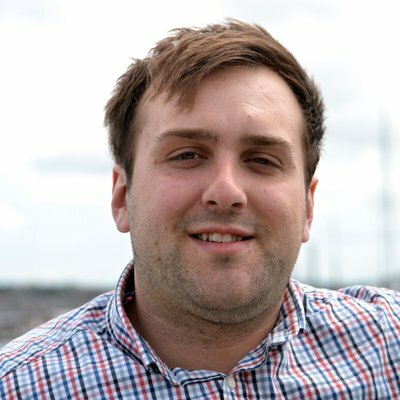 I wrote a post a while ago with my tips for people that are starting off a physics degree. Just after I published it a friend and fellow post graduate, Sam Cooper, pointed out to me that I made a fairly blaring omission in my summary of undergraduate physics. Vectors. I was going to sneak in an extra section but I had a think and figured that it actually deserved its own post, so here goes. If you’ve done A-level physics I’m sure you’ve come across the idea of a scalar before. Scalars are essentially just numbers that are used to represent quantities. They are only able to represent the magnitude of a measure, or put simply how much of something there is. Vectors are mathematical objects that allow you to represent not only the amount of something there is, but the direction in which this measure is acting as well. These are incredibly useful and as a result of this they are used extensively throughout physics. In an undergraduate degree the most applicable use of vectors are most likely going to be in vector mechanics and electromagnetism. I’ll go through some applications at the end, but first some theory. Most people are used to manipulating scalars in the form of algebra, but when we’re using vectors we need some slightly different rules for manipulating mathematical expressions. This is the field of vector algebra. Because of these different rules it’s common for vectors to symbolised differently in equations. The problem is that there isn’t a globally consistent way of doing it. In some texts vectors are represented by emboldening the symbols, such as . Another way, and the way which I shall use in this post, is by placing an arrow across the top of the symbol . Just for the sake of formality, I’m going to be working in a 3 dimensional Euclidean space, the basis vectors of which consist of 3 orthonormal components. This may sound difficult to understand, so it’s worth explaining what this actually means. An orthonormal basis means that you build your vectors from basis vectors of unit length in that space and that none of the basis vectors can be projected into any of the others; they are all at right angles to one another. The basis vectors of Euclidean space are generally represented as . and . These vectors lie along the x, y and z axes respectively. They can be represented in vector notation like so. Vectors are made up from the basis vectors of a given space. In this example the vector is made up of (red), (green) and (blue). The black dashed line shows the resultant vector. The same basis is necessary as in this notation there is nothing explicitly stating the basis. If in doubt just revert back to the long hand notation, shown in equation 2, as it leaves little room for ambiguity. You should note here that the resulting vector has a negative contribution of . It’s also worth nothing that the is missing. This is because the resulting vector contains of , so there’s no need to write that term down in this case. We can now substitute in coordinates for this field to find out if the field is divergent at a given point. Let’s just for the sake of argument use and . This yields a value of . This indicates that at the coordinates we specified, the field is strongly convergent and the point is acting as an effective sink. 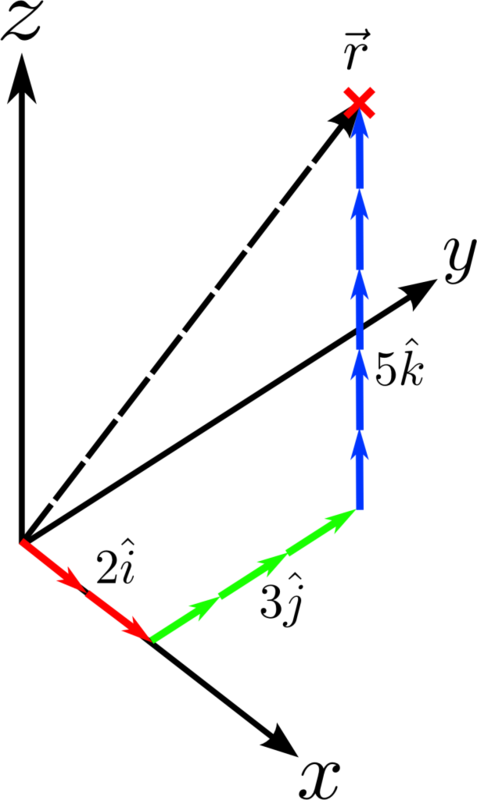 This figure shows a vector field with two points annotated. A shows a point of high convergence, where the arrows are flowing towards a source. 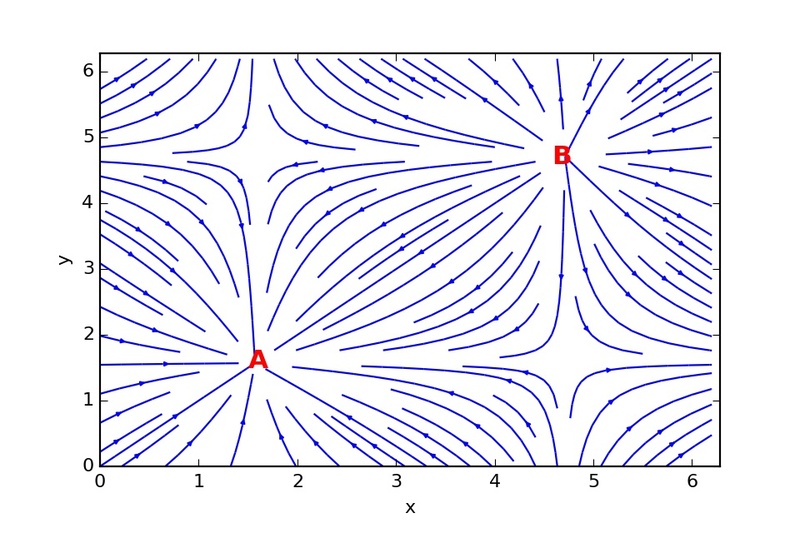 B shows a point of high divergence, where the arrows are flowing away from a source. 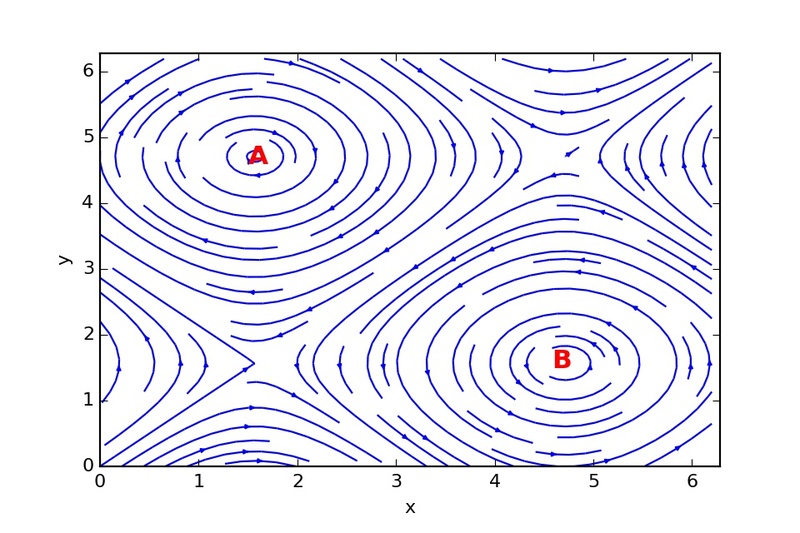 This figure shows another vector field. Points A and B show points of high vorticity, hence a large curl. This concludes our whistle stop tour of vectors in physics. It’s at this point you’re probably wondering where you might be able to apply this knowledge of vectors. I’ve discussed the pure mathematics of it, but where can they be applied in physics problems? I’ll just go through some of them now. Classical mechanics is a discipline in physics that nearly relies entirely on vectors. This is why it’s often referred to as vector mechanics. It should come as no surprise that displacements of objects in physics problems are very easily represented using vectors. Not only this but vectors are ideally suited to representing the velocity and acceleration of an object. Another major use of vectors is the representation of forces in a classical system. Vectors are invaluable because they can not only represent the direction in which the force acts, but they can also represent the strength of the force. Many problems that you’ll be faced with in this topic will ask you to resolve forces. This means that you add all the forces being applied to an object together to come up with a net resultant force . Once you’ve calculated this and, assuming that the force is constant, it’s a trivial matter to calculate the acceleration, velocity and position of an object over time. When dealing with electromagnetic forces it’s often easy to lose sight of the fact that you’re actually dealing with the interaction of objects with the underlying electric and magnetic fields. Electric fields are easily represented as scalar fields. Using this representation we can perform all the operations mentioned above. Some of these operators are also used in the formulation of Maxwell’s equations, the fundamental equations of electromagnetism that have the power to describe not only the initial state and dynamical evolution of a given electromagnetic system, but they’re the root of some important proofs. One of the most iconic is the description of light as a coupled self-propagating electric and magnetic field. You can also perform integration within the framework of vector calculus. This is involved in the formulation and manipulation of Gauss’ equation. This equation allows the calculation of the electric field around a charge by performing a surface integral over a Gaussian surface surrounding the charge. Also using vector calculus you can calculate the magnetic field induced by a flowing current using a line integral. It’s probably fair to say that electromagnetism is probably the largest use of vector calculus that you will come across doing an undergraduate degree. I’ve written extensively about fluid mechanics before in this post, this post and this post so I won’t bore you with the specifics, but just as in electromagnetism, fluid mechanics makes extensive use of vectors. The flow of a fluid is expressed as a vector field of velocities and the density of a fluid at each point can be expressed as a scalar field. Using these fields we can evolve a system using the governing equations of a given system. One of these is the momentum equation, known as the Navier-Stokes equation. This equation isn’t easily solvable, so studying the characteristics of the fluid using our operators can allow us to simplify it. The divergence operator can be used to see if the system we’re studying is an effective sink or source, allowing the characterisation of sink or source terms in our equations. The curl operator is a good measure of a system’s vorticity, allowing us to conveniently analyse flow characteristics; whether the system is in a laminar (slow, straight) regime, or a turbulent (fast, high vorticity) regime. With these fluid characteristics in mind, we can make meaningful simplifications to equations that make them easier to solve while retaining the physically significant terms. This is the time independent version of this equation. You can see that it makes use of the grad operator to attain its results. This important equation allows the calculation of the energies of all possible eigenstates of a particle. In some notations of quantum mechanics states of a particle can be represented as a vector. This vector contains probability amplitudes that express the superposition of states that constitute a given quantum system. This is true of various quantum operators such as energy and momentum. This representation holds true for any solvable quantum system, such as the infinite and quantum square well, known as the particle in a box, and the quantum harmonic oscillator. Although this is a less common use of vectors, its still worth noting. 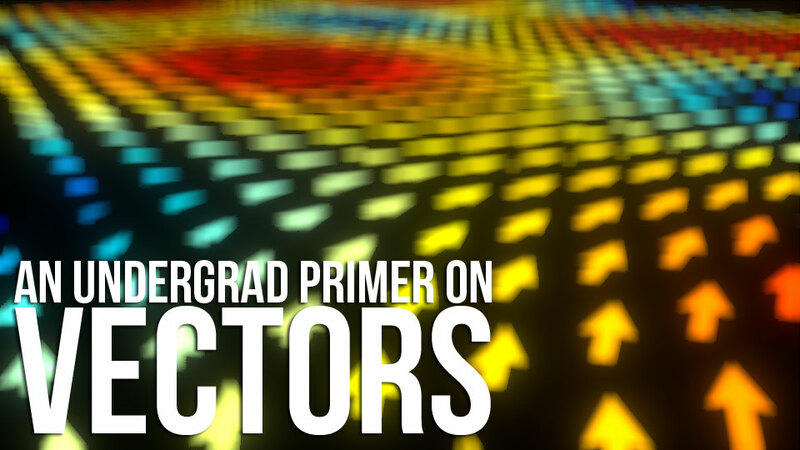 That more or less sums up the basics you’ll probably need to know to get off to a good start with vectors at degree level. It’s worth stressing at this point that this post has focussed purely on 3D euclidean space. All of these operations are however completely applicable to any set of bases vectors. Probably the two most useful are cylindrical coordinates and spherical polar coordinates. Cylindrical coordinates adopt the , and coordinates, which represent angle around a cylinder, radius outward from the origin and height from the origin respectively. Spherical polars adopt the , and coordinates, which represent the radius outward from the origin, the angle around in the x-y plane between 0 and and elevation angle between and . There are plenty of references out there and you can find plenty of examples out there of their use. As always I hope this post has been useful and if you notice anything amiss please do let me know and I’ll correct it ASAP. Until time, thanks for reading. E. Kreyszig, Advanced engineering mathematics, John Wiley & Sons, 2010. H. D. Young, R. A. Freedman, and A. L. Ford, Sears and zemansky’s university physics, Pearson Addison Wesley, 2004.